As Bill Clemens resumes his retirement, Roy Caldwell takes the leadership of UCMP as the new Interim Director. Roy is a professor in the Department of Integrative Biology, and his research interests lie in tropical marine invertebrate behavior and ecology. His current work focuses on the behavioral ecology of stomatopod crustaceans, a group of tropical marine predators commonly known as mantis shrimp. Two hundred million years ago stomatopods evolved a pair of enlarged raptorial feeding appendages that also serve as potent offensive and defensive weapons. Much of Roys research is concerned with how various aspects of stomatopod biology and behavior have coevolved with the development of these potentially lethal weapons. More recently, his research has expanded to include the evolution of mating systems, sensory ecology, larval biology, and studies of the genetic structure of stomatopod populations as a means to deduce the timing and pathways of dispersal. 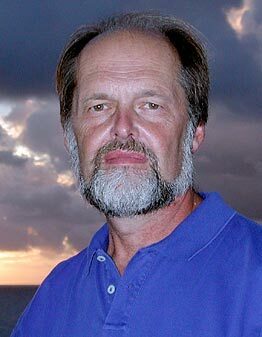 Roy serves, along with Dave Lindberg, as the Principal Investigator of the Understanding Evolution website. opportunity for Bill to continue some research at the Natural History Museum. Highlighted in the UCMP December profile, Bill describes the evolution of UCMP over the years: “Surfing UCMPs web pages reveals a tribute to how much has and is being accomplished. These are achievements of which we all can be very proud and form a starting line for future developments.” We thank you, Bill, for your dedication and leadership that have contributed to these achievements.